Women retreats are becoming increasingly popular, as us Tango Divas know (and love). One of our favorites: surfing! Combining activity, sightseeing, and relaxation with beautiful scenery is purely bliss. Or should we say is “Pura Vida”? 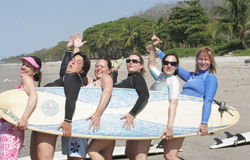 Pura Vida Adventures in Costa Rica is offering one lucky gal and her friend an amazing surf retreat. Read the contest rules and enter to win! Good luck future beach babes! Read Tango Diva’s previous winner’s life changing Costa Rican experience.